On our PCs we use loads of a program on day today basis and sometimes we would like to monitor the memory usage of certain applications, I personally like to have check on the memory usage of Firefox browser. 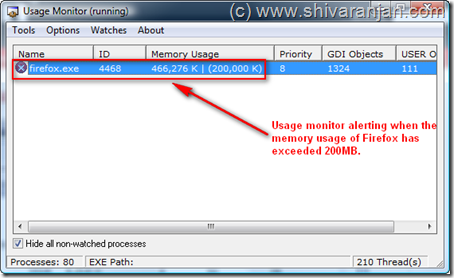 Usage Monitor is a free application using which you can monitor an application or software’s memory usage, GDI objects usage and USER objects usage. Once you set the limit for an application’s memory, GDI objects or USER objects usage, if the set limit or threshold level is breached audio and visual alerts will be triggered . There is an option using which you can a program can be executed to alert you if the set limit or threshold is exceeded. The GDI objects and USER objects usage monitor is useful for only application developers whereas memory usage monitoring will be useful for everyone. We tested this application in Windows XP and Windows Vista.